Sustainable development with cost effective solutions remains the core to success. With region enjoying 365 days of Sun and laying in a Global Sunbelt, scalable Solar and Microgrid solutions seem to be the future. Harnessing renewable resources with traditional fuels, new Microgrid Solutions promise reduction in fuel cost and harmful emissions. Providing clean, cost-effective electricity to keep your industries operational, businesses developing and people connected. Cat® Solar and Microgrid solutions are fully customizable and accessible to meet your power needs today and for future expansions. WHY THE TIME IS NOW. Cost-effective electric power has been a challenge for industrial and commercial installations. Not all, are benefitted with strong grids. 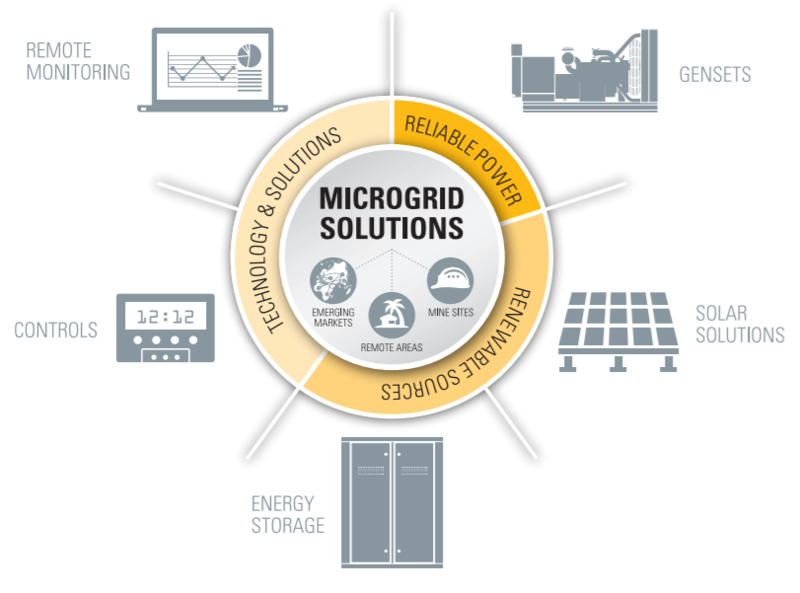 Cat Solar and Microgrid Solutions can bring a difference. Get products you need and support you can depend on from Al-Bahar. We are with you at every phase of your project. From site audits, consultancy, delivering a complete turnkey solution, after sales support, O&M agreements, and more. The innovative Cat energy solutions are designed to power a better world, while minimizing economic, social, and environmental costs. Cat Tucson facility, which includes workshops and an office building, is too remote to easily connect to the local utility grid. Three Cat® C15 diesel gen sets ran continuously all year long, using approximately 250,000 gallons of diesel fuel each year. It was clear the facility needed an alternate power solution to reduce costs and align with their sustainability efforts. Tucson Proving Ground reduces its diesel fuel use by 33 percent and its gen set operation by 25 percent. Available worldwide through the Cat dealer network, this installation is an example of a real-world application of Cat Solar and Microgrid technology for the commercial market. Cat Solar and Microgrid technology offers fully integrated power systems for off-grid locations and backup power. The systems include photovoltaic panels, energy storage, monitoring and control systems, Cat Generator Sets, switchgear, UPS, and ATS. Al-Bahar remains at the forefront, providing complete renewable solutions and delivering the technology at your doorsteps. Get your own Cat Solar and Microgrid solution - Tell us about your requirements and our expert team will be in touch to discuss the possibilities.